The idea of closing the west side of the Cortile Carrara was already indicated in Ammannati’s plans and later revived by the architect Juvarra, but in fact the project was not completed until the eighteenth century. The Government in Lucca had already purchased Casa Macarini for this purpose in the sixteenth century, this house corresponding to the south part of the Palazzina, where kitchens and other services for the Elders’ apartments were installed. The appearance of the Palazzo, however, remained unchanged even after construction of the north wing between 1724 and 1744. Maria Luisa Borbone bought Casa Totti and a part of Casa Mansi and demolished them in order to close the northeast front of the Cortile. 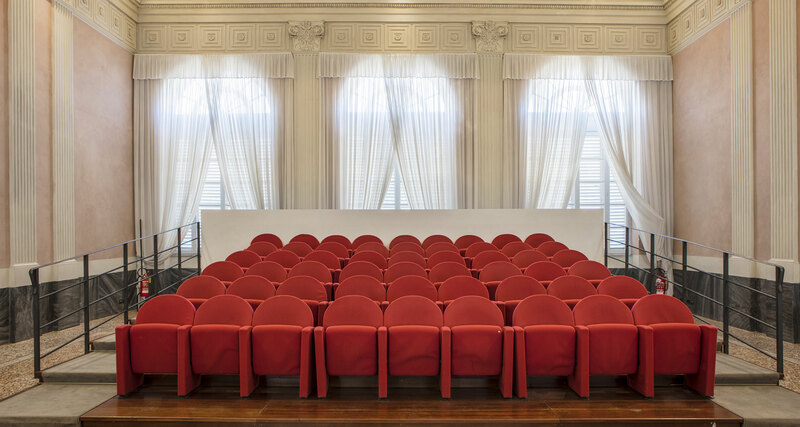 This project was assigned to Lorenzo Nottolini who put it into effect while preserving the Church of Santa Maria della Rotonda and the little Court Theatre. The Villa was completed in 1834 and made into the offices of the Private Royal Secretariat of the Cabinet and theState Council. 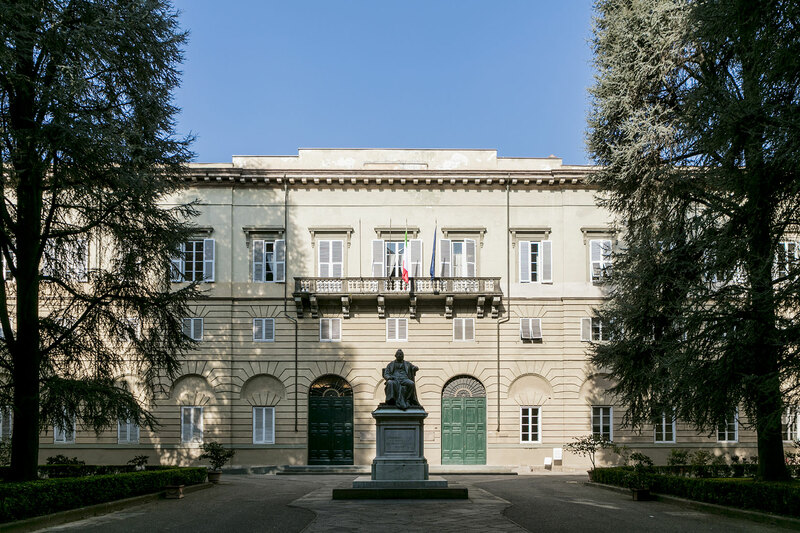 The terrace that opened on to Cortile Carrara was demolished in order to create (between 1870 and 1872) the two apartments that were to accommodate the Court of Assize on the ground floor and the Court of Appeal on the first floor, plans for these being prepared by Bernardino Poli. This involved modifying and distributing space for the offices required by the courtrooms, according to contemporary standards of efficiency. When the Court of Assize was abolished, the space on the first floor was occupied by the offices of the Presidency and the Administrative Council of the Province. Unification of government in the new Kingdom of Italy was accompanied by reformation and unification of the judicial system. 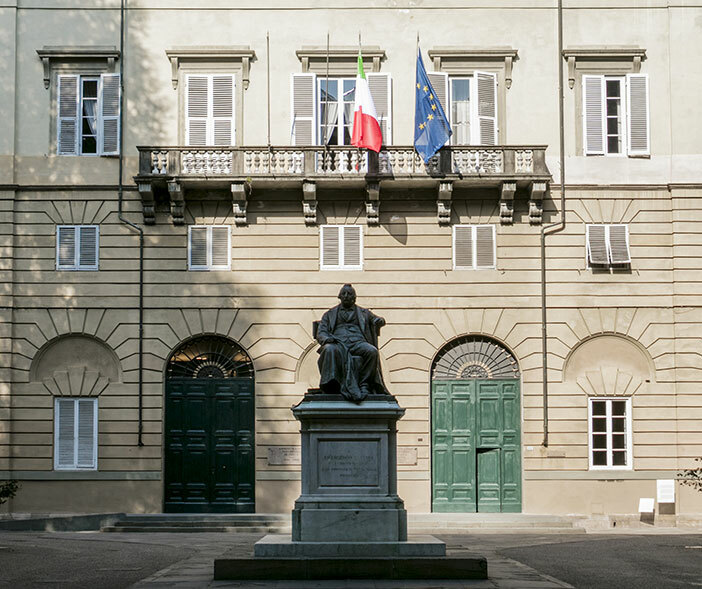 In Lucca, the problem of reorganising the courts arose from the fact that the rooms in the old magistrates’ building in the Palazzo Pretorio were too cramped for day-to-day work to be carried out. The solution chosen was to rearrange Nottolini’s New Palazzina with the Assize Court on the ground floor. 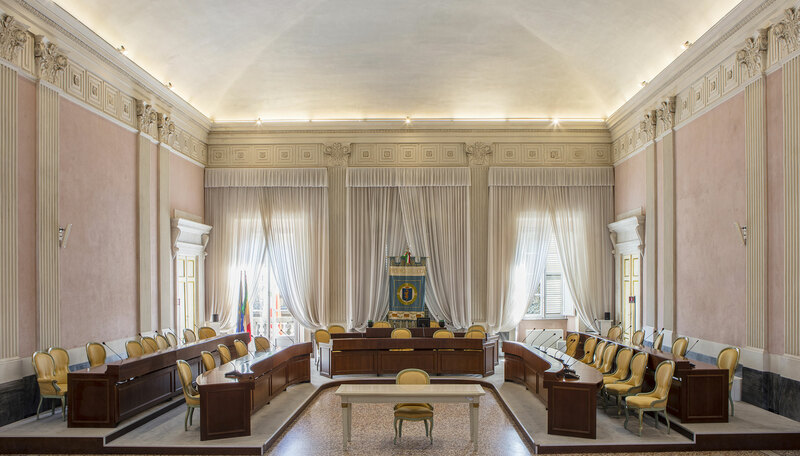 From a letter sent by the President of the Appeal Court to Bernardino Poli, chief architect for the Province of Lucca, we know what the requirements to be taken into account in preparing the plans were. 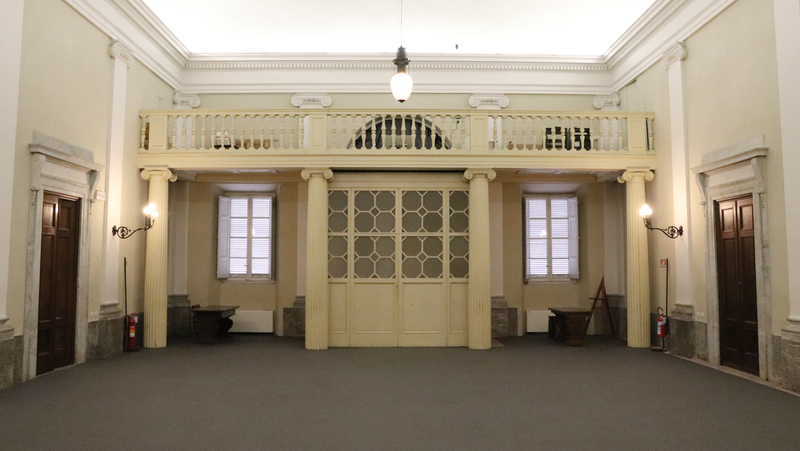 The new Assize Court was to have a large debating room that could also be used for general assemblies, together with carefully separated spaces and different doors for accused persons, judges, witnesses, lawyers and the general public, who would preferably enter the courtroom directly from the outside. Then there had to be a Deliberation Room with cloakroom and toilet facilities, connected to the judge’s bench. Also required were rooms for the Session President, a waiting room for defence counsel, two separate rooms for prosecution and defence witnesses, a holding room for accused persons in custody, a private room for the twelve jurors with attached toilet facilities, a room for the prosecutor, one for the clerk of court and a variety of offices for related business. Court administration and records offices required another fourteen rooms. Bernardino Poli plans included all of the above and were approved on the 15th of July 1868. The Courtroom was to have a vaulted ceiling occupying the entire depth of the building and a little central courtyard and was to be the most ambitious part of the scheme. The large hall was to be decorated in a sober fashion with marble-framed doors, a granite dado, Ionic pilaster strips on the walls and a large plaster cornice. In the event, the ground floor area was not big enough for the whole Court complex and the court offices had to be accommodated in the south part of the intermediate floor. Work began immediately and was completed in the spring of 1870. We owe the Palazzina’s present appearance to Bernardino Poli, chief architect in the Province’s Building Department who adapted the building between 1871 and 1872 to accommodate the Royal Assize and Appeal Courts by doing away with the central courtyard on the ground floor and making use of the space on the first floor which was then occupied by a large terrace, an open passage and the main part of the building on the west side. 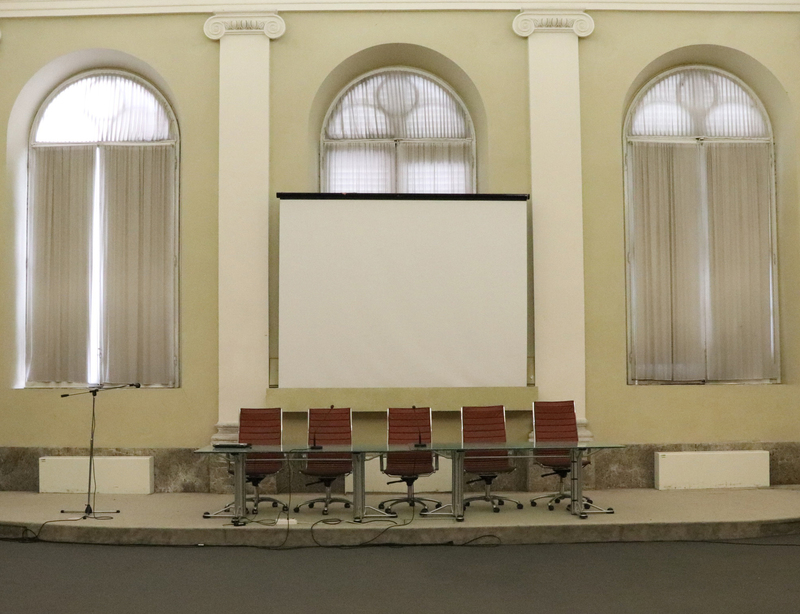 The building work for the large room to be used as the chamber for civil hearings is described in detail in reports prepared in the Province’s Building Department and the bills sent in by the various workmen involved in the building works. The plans included raising the perimeter walls of the main building, making a new roof and increasing the height of the walls by a quarter to create the lower intermediate floor and support the floor of the main chamber. We also know from these documents that the vaulted ceiling of the chamber had trellised plasterwork with barrel centring with a stucco rosette in the middle. The walls were divided by glazed mortar stucco pilasters and frames with composite capitals and bases and a cornice with a terracotta frame about 1.3 metres long, moulded, plastered and dressed with white stucco “applied with the tip of a trowel”. The cornice and dado were in glazed grey stucco and the doorways had stucco frames and brackets. The floor was in terrazzo and the skirting in glazed stucco with fine marble veining. The ceiling and walls were first plastered with mortar from the San Lorenzo and Compigniano limekilns and then painted by artists Antonio Ghilardi and Giovanni del Frate, the ceiling being very pale sky blue and the walls violet. On the west side of the room there was a passage divided by a quarter wall, the upper part of which had a gallery with a bricked floor supported by beams and rafters, with a rail and turned wood balusters painted white. The plans included six new doors in the Turin style (one of which did not open) painted in semi-gloss white with gilded frames. In Bernardino Poli’s 1870 plans for alterations within the New Palazzina, the first floor areas with fifty-eight rooms were to become the Appeal Court and its offices. Part of this project included the complete rebuilding of the room which is now occupied by the President’s secretarial staff. From the 1868 plans and more particularly from the description prepared in 1872 at the time when the Provincial buildings occupied by the Royal Appeal Court and the King’s Prosecutor were handed over to the Prefect, we know what works were carried out in the three rooms called the Secretary’s Room, the Reception Room and the Deliberation Chamber. The Secretary’s Room (now the Council Chamber) had a painted ceiling, the walls were covered with green and gold French paper from Valentino Betti in Lucca, and the chequered floor was varnished. It had no fireplace and was heated with a clay stove painted in purpled bronze with a metal pipe fixed in the wall. The Reception Room (now the President’s Office) had a painted ceiling and the walls were covered with pale French paper with gold flowers from Valentino Betti in Lucca. The floor was “coloured with oil and varnished” and the room had a fireplace in white marble with bas-relief. The Deliberation Chamber (now the room for the secretarial staff). The works in this room were more ambitious and involved rebuilding the perimeter walls It had a trellised ceiling with stucco frieze, plasterwork and a “coloured and varnished chequered” floor. 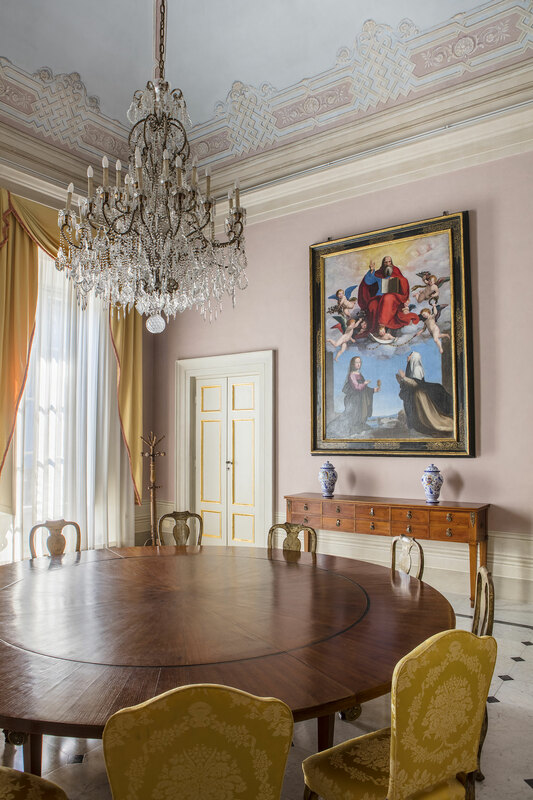 The room had a marble fireplace, a chiaroscuro ceiling, a dado and a work by the painter Antonio Ghilardi. The walls were covered with red paper with gold flowers.